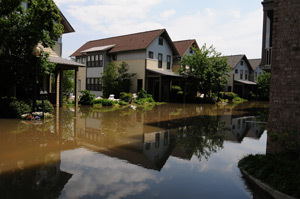 Dealing with water damage can be chaotic for any home or business owner. Resulting from leaking or broken pipes, heavy storms, or worn structural fixtures, the damages associated with water damage can range greatly — it is all dependent on thetime it takes for you to take action. The longer you wait, the more damages you can accrue. Immediately call in a water removal service. ServiceMaster Cleaning and Restoration Services are the experts for any disaster restoration recovery. Our technicians will take the necessary measures to find and stop the source of water damage, remove and attempt to restore any items within the area that’s been affected by water, and begin the restoration process of drying, dehumidifying, and sanitizing your home or business. We also provide tarping services to protect your property from water intrusions. Tarping can help prevent additional water from entering your property and cause damages. When needed, our experts will apply and install protective tarps to the exterior of your property to direct water away from your property, as well as use them indoors to collect and protect your structures and floors from leaks. We make it our mission to offer the highest quality of service and satisfaction. Trust ServiceMaster Cleaning and Restoration Services for a complete restoration process. DO call ServiceMaster Cleaning and Restoration Services for water restoration services as soon as possible. DO open all of your doors and windows to enhance the drying process, if weather permits. DO remove as many belongings from the affected area to avoid damages. DON’T hesitate to contact the experts at ServiceMaster Cleaning and Restoration Services. DON’T use any electrical outlets, appliances, or fixtures. Electrocution may occur. DON’T attempt to remove black and grey water by hand.